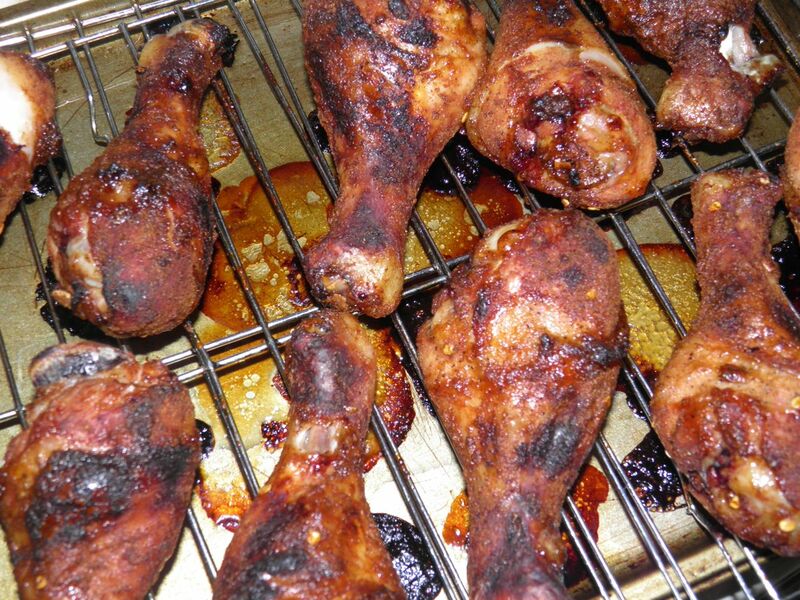 Easy Honey Garlic chicken drumsticks. Moist, flavourful and tender. The other night I pulled into the grocery store on my way down to my mother’s house in the country to pick up dinner. Since she’s getting on in years I don’t like for her to have to wait on me. It’s now my turn to wait on her. She always offers, I always say no, but there always seems to be something there for me regardless unless I’m very firm in my objections. Mothers… what would we do without them. Anyway, I was determined this time that I would be making my own dinner. I always go scouting when I reach the grocery. I look for deals, bargains, mark-downs that still have shelf life – you name it. My eye caught sight of pre-seasoned and frozen chicken wings and legs. They were on sale. I have two big objections to pre-packaged/seasoned foods. If you read my rant about the haddock and mushroom bake a couple days ago you know my aversion for canned soup. My first objection is that I have no idea what is in it. All manner of evil (disguised as things to extend shelf life, etc.) could be lurking there. Secondly, most times – almost without exception – pre-packaged meals are overpriced. So pre-packaged foods hit me in my conscience as well as my wallet. Even on sale those wings and legs were no “can’t resist” deal at $11.99 per package. So I walked on by. But my craving didn’t come with me. They did look tasty… After looking around for a while longer for something – anything – else I headed to the chicken section. I would maybe make my own. Chicken is usually expensive (what isn’t?) but I though it wouldn’t hurt to look. Whoever invented zip-lock bags should be given a medal. As I thought, 10 chicken drumsticks would set me back $7.99. I hate to pay that for a pork or beef roast if I can avoid it. $8 for a few chicken legs??? So I had to do some quick rationalizing to convince myself it was OK to buy those legs. They were very large… and they were $4 less than the prepared variety… and I wanted chicken. I had convinced myself, so into my cart they went. 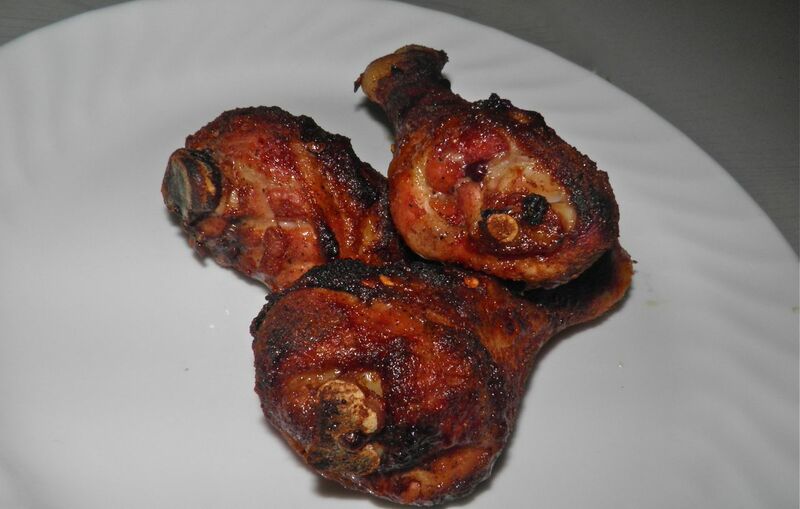 Making baked chicken wings or legs is quite easy. You probably have everything necessary, except for the chicken, to make may different types. All you really need is a decent spice combination (your choice) and the time to let those spices flavour the chicken meat. You can make up pretty nearly anything you want. Just think of what you have on hand. I opted for honey garlic since I had honey that needed to be used. I have to admit that these take longer than the 30 minutes of the pre-seasoned variety. But the legs I bought were about twice as big. And as far as time, there is a reason that stuff is called “convenience” food. I far prefer to take the time necessary to make my own, exactly as I like, and know what is in the food that I’m eating. I hope you agree. To boost the honey-garlic taste you could make a dipping sauce for the table. Mix some honey, soy, garlic and ginger powder together. Place it on the stove, bring to a simmer and thicken with a little with cornstarch. I’ll leave the quantities up to you, depending on how much you want to make, but take a hint from the order I listed the ingredients in. That's a good place to start. drips out onto the pan and away from the food. Mix all the ingredients (except for the chicken) in a small bowl and let sit for about 5 minutes for the dried spices to bloom. Meanwhile, place the chicken drumsticks in a zip sealable bag. Pour the sauce over the drumsticks and rub well to get the sauce well distributed. 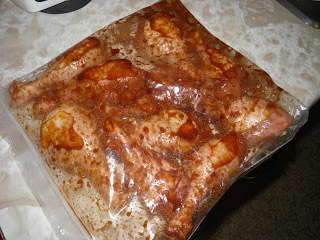 Let the chicken marinate in the spices for 1 hour on the counter, or overnight in the refrigerator. 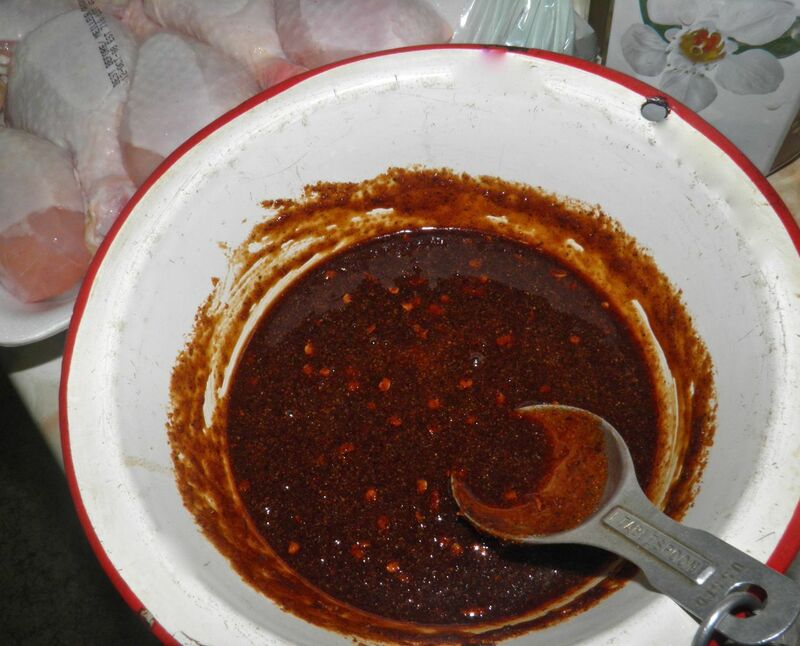 Remove the chicken from the bag and reserve any marinade for brushing. Place the drumsticks on a rack suspended over a rimmed cookie sheet. This allows the heat of the oven to touch all sides of the chicken. Bake in the centre of the oven for 40-50 minutes, depending on the size of your chicken pieces. Turn halfway through and brush with the reserved marinade. The internal temperature on an instant read thermometer must be 180°F.